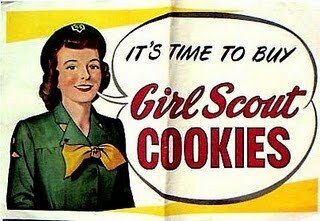 In Kansas, KSAL News reports that Girl Scouts of Kansas Heartland would like to thank the community for another successful Cookie Sale. Girl Scouts across 80 Kansas counties sold nearly 1.5 million boxes, a 7.6% increase over last year. The 2011 Cookie Sale took place Janury 22 through March 13. Additionally, 15,328 boxes were collected for the Cookie Share Program, up 48% from last year. These cookies will be distributed to the Kansas Food Bank, Catholic Charities, McConnell Air Force Base, the Kansas National Guard and local food pantries. Congrats Girl Scouts of Kansas Heartland! How have recent cookie sales been in your community?